Have I mentioned how much I love swapping? The idea of bartering items with your neighbors has always been an appealing one to me. I love barter fairs, swap meets, flea markets and potlucks, I even went to a CD burning party back when we used to burn CDs. This rolls all of the best things about potlucks — trying someone else’s special dish, learning about new recipes, techniques or ingredients — and all of the best things about bartering — like meeting new people, getting to go home with some of those delicious food items, and the overall satisfaction you get from knowing you got a great deal — into one incredibly rewarding afternoon. Step 1: Decide what to make and make it. Nothing is off-limits. We’ve had breads, jams, sauces, chutneys, salts, dressings, desserts, cookies, empenadas, chile rellenos, several variations of pulled pork and BBQ pork or other meat, homemade beer, ice cream, roasted tomatoes, salsas and more. Many people also bring vegetables from their gardens or fruit from their trees. There are no rules. Personally, I used some oldies but goodies to swap, my smoky plum BBQ sauce, apple cider jelly and spicy pickled veggies, as well as an extra jar of roasted berry/pepper jam. It was a lot of work, but I walked away with at least one of everything. Score. The idea is to walk away with one of everything. It feels so good to come home with all of this! Step 2: Separate the food — about 2-3 servings. Say, a jar of jam, a loaf of bread, a tupperware container of meat, a ziplock baggie with a few pastries or cookies — you get the idea. Again, there are no rules. Step 3: Show up and swap it! I cannot really emphasize enough the extent to which There Really Are No Rules, except that everything is swapped. No money changes hands. Sometimes people have run out of a particular item, in which case they might trade someone an item for an IOU, or negotiate a co-swap with another participant. This is also why we recommend that if you bring something that may be prohibitive, that you also bring an alternative — for example, one swapper makes a simply phenomenal empenada recipe handed down from her father who is Argentinian. 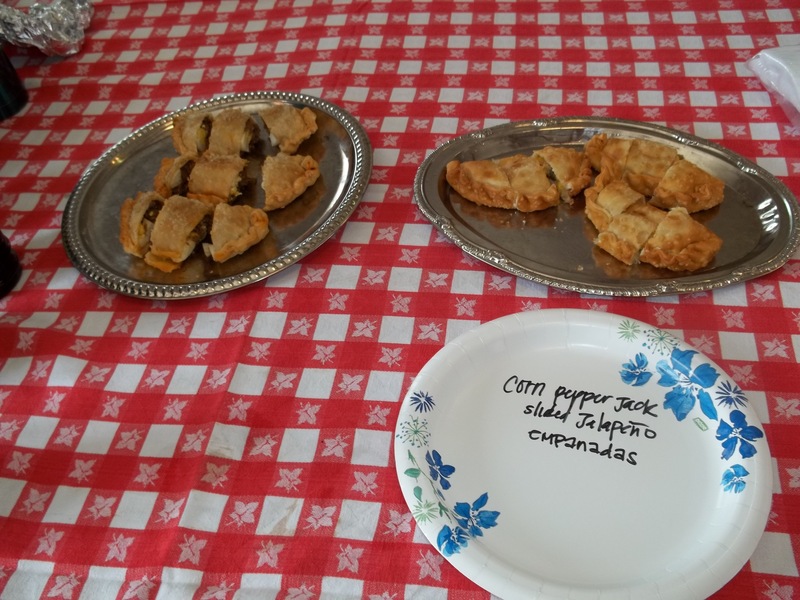 The Argentinian style is to stuff the delicious hand-sized pies with ground beef, green olives and hardboiled eggs with a ton of delicious spices, but since some people don’t eat beef or are vegetarians, she also made a second batch of empenadas with pepper jack cheese, jalepenos and roasted corn. Of course, you don’t have to bring a vegetarian alternative, but in the event that you want to swap with a vegetarian, the issue might come up. These empenadas will knock your socks off. Which brings me to the next best thing about a food swap: it’s a community event. It’s not a competition for the best item or the most sales, nor is it a money-making endeavor where you want to sell your wares and make sure you don’t get swindled. Everyone seems to feel the good vibes and so far, I have done four of these events in San Diego and have never seen anyone leave unhappy. I’ve blogged about how great food swaps are before here and here, but honestly, I can’t say enough about how great they are. It’s hard to put into words the spirit of community and the feelings of good food that run rampant at each event. The feeling started before the swap even began. A woman contacted me and told me she couldn’t make it to the swap because she was volunteering somewhere else at the time, but had a veritible orchard in her backyard, consisting of wine grapes, fig trees, apple trees and countless other greens, herbs and vegetables. She brought me shopping two bags bursting with fresh fruits before the swap and insisted she didn’t want anything for it, and that she was just frustrated that she didn’t have enough recipes, especially for the figs. This is courtesty of swapper and baker extraordinare Peggy Spitz (she made an insanely tasty Kona Banana Bread for the August San Diego Food Swap, which I could eat for three meals a day). 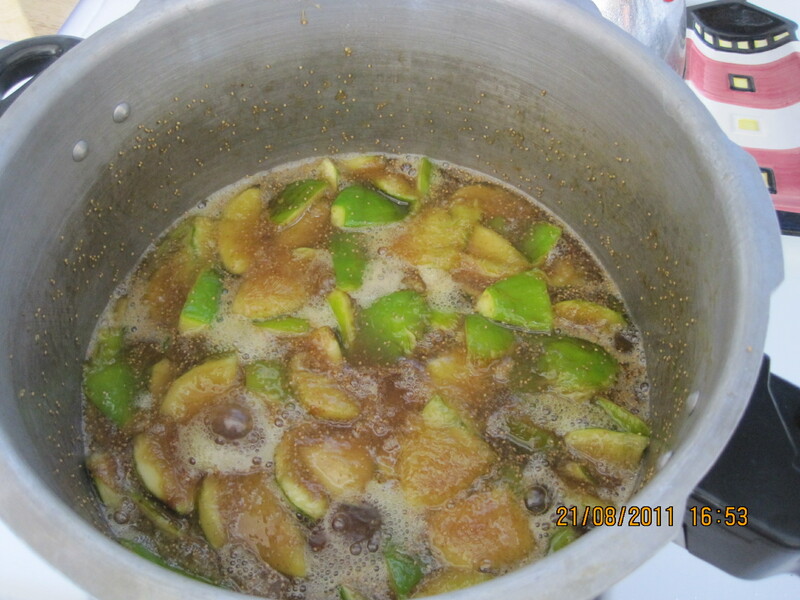 Simmer until the figs are tender, and puree the chunks through a food processor or blender and reheat, or use an immersion blender while cooking. 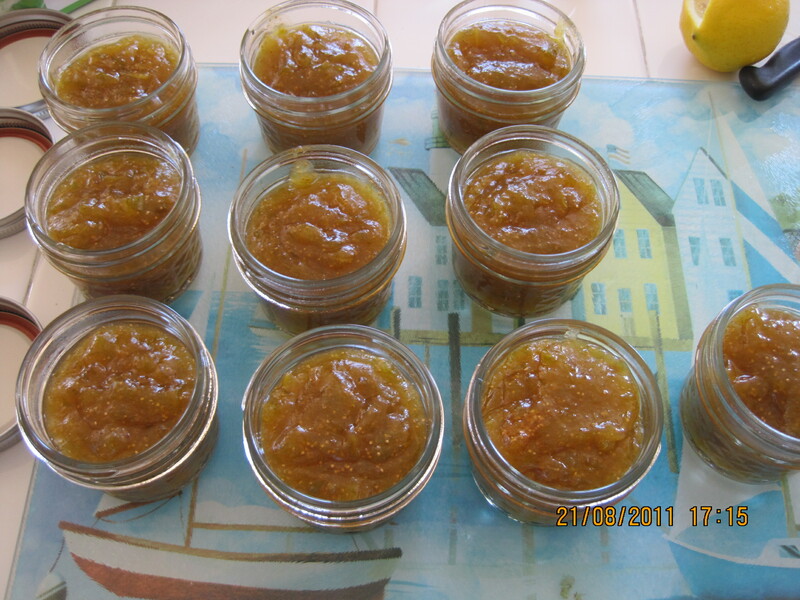 Add a teaspoon of vanilla place them into mason jars (makes about 10 small jars). Some of the food swap fixings don’t need mason jars or canning time. 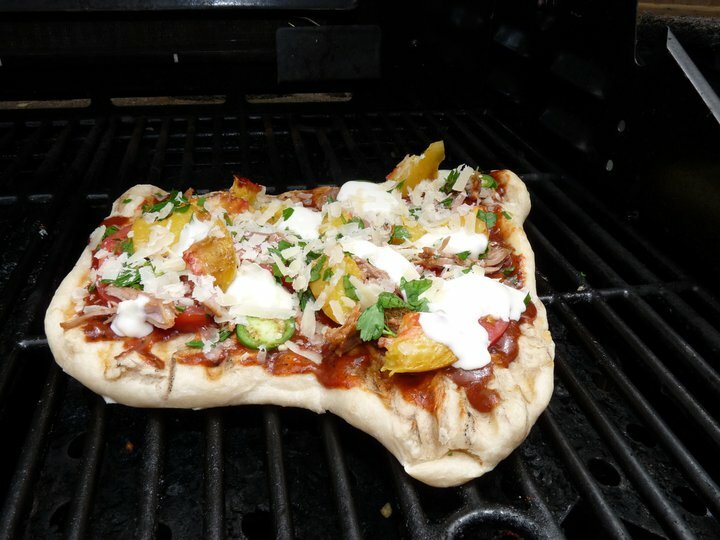 Swapper Elena Romero made a delicious post-swap pizza pie with her own homemade pizza dough (which she also swapped), my plum BBQ sauce, pulled pork from swapper Sandy D’Onofrio, and a few homegrown chile peppers. 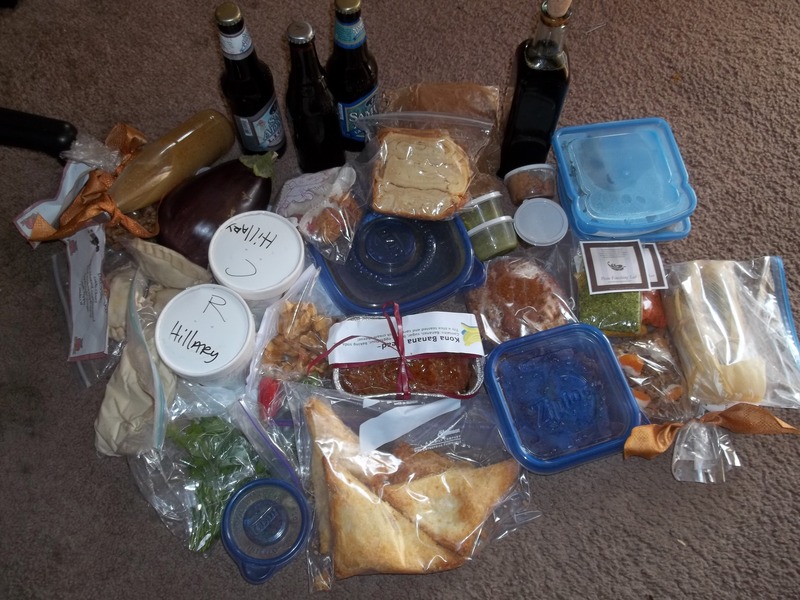 The bottom line is, you can’t afford to NOT go to the food swap in your town. Check here for a list of the organized towns with food swaps I know of. If you don’t have one, start one like I did. The reward is so worth it!